2x 60ft. 24 row planter, no-till capability with GPS Auto-swath control Rogator sprayer. We have one tractor equipped with Autopilot RTK GPS, with less than 1 inch accuracy. We have another tractor with Autopilot OmniStar, with 2-3 inch accuracy. We are able to install cutting edge tile drainage systems. We own our own dozer for light work and brush removal. We have a dirt scrapper for waterway and terrace work. 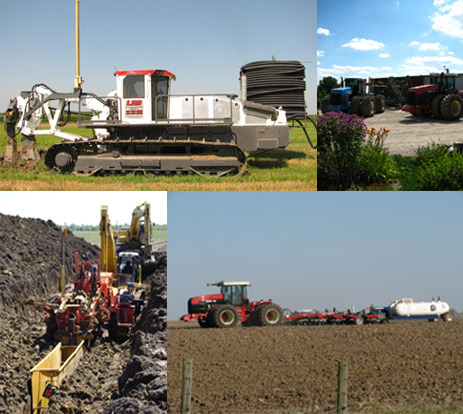 We own our own excavator for use in our field tiling, cleanup, and demolition.